Don't be fooled by imitations that just 'sit' there - without movement they're useless! This life-size realistic predator has a wingspan of nearly 4 feet - these patented wings lift and fall as the head and 'airfoil' body move in the wind. Always-moving 'hunting' postured owl never perches so birds can't get used to it (don't be fooled by imitations that just sit there - without movement they're useless). Scare pest birds away naturally with this lifelike visual scare device. 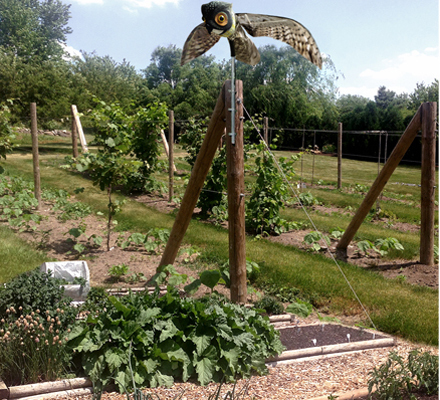 The Prowler Owl's mission - to rid your area of bothersome birds. The Prowler Owl is always moving, shifting, 'hunting' or 'attack' posture, never perching - so other birds can't relax or get used to it. 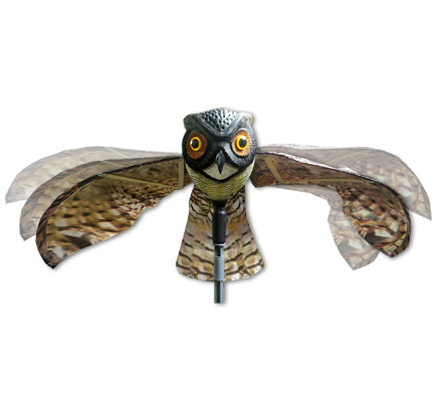 The Prowler Owl is the most realistic life sized predator on the market with accurate markings, and spanning nearly 4 feet with patented flapping wings. The Prowler Owl is modeled on the Great Horned Owl: the most-feared predator that catches and eats almost anything that moves, including pigeons, starlings, geese, rodents, rabbits, squirrels and even skunks. 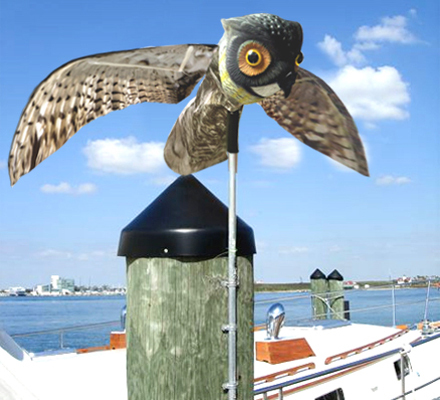 The Prowler Owl is the perfect patrol for gardens, parks, golf courses, marinas, rooftops and open areas. Set it up anywhere -- the breeze and its natural appearance take care of the rest! The Prowler Owl deters birds with a terrifying appearance, but it doesn't harm them or the environment. Shipping Box: 2 lbs., 12" x 7" x 10"